Newport Beach and Stockton, Calif. – CT Realty has leased a newly-constructed 1,122,341-square-foot industrial building to Amazon at NorCal Logistics Center in Stockton, Calif. Terms of the lease were not disclosed. The transaction marks the completion of CT’s roughly 1.7-million-square-foot first phase at the 345-acre NorCal Logistics Center, following the sale of two completed buildings totaling 575,127 square feet to Prologis in July 2018. CT was represented by Kevin Dal Porto, John McManus, Blake Rasmussen and Tyson Vallenari of Cushman & Wakefield. Located at 4532 Newcastle Road, Amazon’s new fulfillment center benefits from proximity to Burlington Northern Santa Fe and Union Pacific intermodal facilities and is accessible to SR-99, I-5, I-205 and I-580, linking to all major Northern California markets and key Western U.S. destinations. The project is home to General Mills, KeHE Foods, Allen Distributors and Fox Head, and is in the heart of California’s Central Valley, a 185-million-square-foot industrial market. The region is an extension of a global logistics supply chain infrastructure that links to West Coast ports in Oakland/Stockton, Los Angeles/Long Beach, Portland, Ore. and Seattle/Tacoma, Wash.
“The evolution of modern logistics infrastructure, including inland ports, sea ports and commercial rail systems, has changed the dynamics of how containerized cargo is distributed nationwide and throughout the world,” added Ewing. “Investing in buildings that are strategically located near this infrastructure is integral to meeting the demands of today’s most progressive logistics users and is at the heart of our national strategy,” added Ewing. The transaction marks CT’s second lease with Amazon this year. 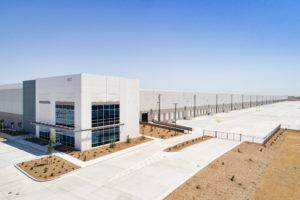 The e-commerce giant also leased a 395,099-square-foot lease at Southport Logistics Park in South Dallas, Texas, a CT venture with Port Logistics Realty and Diamond Realty Investments. CT is underway on the second phase of development at NorCal Logistics Center, with five buildings totaling 2,739,518 square feet that will be built as a mix of spec and build-to-suit projects. CT is also in development on 1.3 million square feet of large scale distribution buildings at Interchange 55 Logistics Park in the greater Chicago area, and is developing logistics centers in Atlanta, Georgia, Dallas, Texas and New Jersey. The company’s current land holdings support the development of nearly 15 million square feet of industrial buildings over the next five to seven years, and CT is actively seeking additional land holdings in 2018 for further expansion.